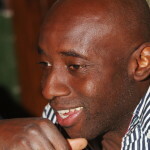 Uche Ogbuji was born in Calabar, Nigeria. He lived, among other places, in Egypt and England before settling near Boulder, Colorado. A computer engineer and entrepreneur by trade, his poetry chapbook, Ndewo, Colorado (Aldrich Press, 2013) is a Colorado Book Award Winner, and a Westword 2015 Award Winner (“Best Environmental Poetry”). His poems, published worldwide, fuse Igbo culture, European classicism, American Mountain West setting, and Hip-Hop influences. He is editor at Kin Poetry Journal, founding poetry editor at The Nervous Breakdown, and runs the @ColoradoPoetry Twitter project.